Being a long-lapsed Catholic, it is questionable whether the Church will heed my warning, but I believe that I must offer it out of an abundance of concern and fondness for so many of its parishioners, and out of a respect for all the good deeds the Church has done among men. 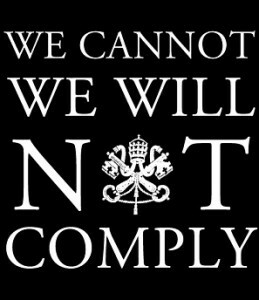 This is aimed at you, the clergy, and the administrations of Catholic institutions. The Obama administration is now at war with the Catholic Church, and indeed with all Christendom. Our First Amendment protections are under open assault, behind the veil of a “womens’ health issue.” Every member of clergy, from the smallest parish all the way to the Vatican must understand, but if you fail to recognize it, we will see the Church replaced by the State in all things. What you are witnessing is the start of a transformation into a tyrannical state, and it is time now for the Church to consider what John Paul II had done when he assisted with the overthrow of the despotic Soviet regime. To protect your flock, you face now a choice, and that is whether to act while you can, or abandon them by your silence, delivering them to servitude at an altar of State. Church is not a military organization, and will not have the force of arms to liberate its flock. Instead, the arms will be turned ultimately against the Church, as has been the case so many times before. The Church has one distinct advantage if they will press it, and the time to exploit this is now: You have the advantage of a long history, much longer than the history of any of the particular oppressors, and your frame of reference is generally much longer in view. While history is not always kind in its judgments of the Church, when it has taken less enlightened directions, still the institution that is the Church must be able to know and to see that the course now in front of us is far from unprecedented. One need only view what happened to the Church in Poland, or Germany, or in a host of countries in which it was in various forms chased from the lives of its parishioners to understand that there is nothing new under the sun, and that as an institution, the Church has seen all of this before. This being the case, you already know how to defeat the State. It is merely a question of the moral will to do so, but if the Church cannot muster this now, then the Church will have lost all moral authority, and will be displaced. Easter is just more than a month away, and it will be your best opportunity to speak to the whole body of the Church in one time for months. as despite what we might like to think, twice yearly you see greater attendance and adherence than in the rest of the year, so let you not squander this opportunity. You will celebrate the crucifixion and resurrection of Christ, and this is an appropriate time to remind parishioners of what the Church exists to do. Your cross to bear is in opening the eyes of your parishioners, each and every one, to the scourges being heaped upon the Church, and upon them, by the encroachments of the State. The subtle lie taught to your parishioners, so many who have been indoctrinated in the governments’ schools, is that the notion of a “wall of separation” between Church and State was placed there to protect the State. This is not true, and has never been true, for the State has nothing to fear from the Church, but the Church and its flock should tremble at the threat that is the State. So it was throughout all of the twentieth century, and so it is today that the Church must cling to this separation as a firewall to protect it from governments. Indeed, his applies to all Christianity, and not only the Catholic faith. These are the options. In considering them, you will be forced to confront the whole history of the Church, from its greatest moments in the face of tyranny to its worst moments as a participant in it. Let me make clear that the first option is and must be untenable to the Church, its parishioners, and the whole body of Christianity. If you yield, this will have been the end of the Church, not only in America, but globally, and you must know by now that once you lose America, the cultural focus of the world, you will have lost the world. If you surrender here, most of the other locales will go along quietly. As the State now encroaches into every aspect of American life, so will it creep in everywhere it had not been in the past. This makes the second option no more tenable than the first. At present, however, the Church operates something on the order of one in six hospital beds in the United States, and some uncounted number of seats in schools and universities all across the land. These are marvelous facilities and institutions, that have served so many millions, and indeed, I was born in just such a hospital nearly forty-seven years ago in Buffalo, NY. In those days, the Church was a constant part of family life. In its rush to modernize and follow trends, it abandoned its traditions in many ways, so that now, its moral authority and its involvement in the daily lives of its parishioners has retracted. By the precedents of human history, this is the time to begin a resurgence. The Church still touches the lives of millions, and yet they to frequently recognize it. In doing the innumerable good deeds Christianity has done in America these last fifty years, too often, it has not been evident that Christianity had been the driving motive for them. It is time to begin to withdraw them. The Church is being told by the State that its services are no longer welcome, and that its influence in the lives of people is not to be admitted, but I say this is a lie, but to show the truth, the Church is going to have to show it. The flock has lost track of the good that is done under the umbrella of the Church, and this applies not only to Catholicism, but also to all Christian institutions of any description across the country. It is time to remind the flock of what they will lose when the State supplants the Church in their lives. The State knows no compassion, and it functions as an automaton, but every Christian endeavor in the country is founded with an institutionalized voluntary human compassion. Cardinal George of Chicago said it best when he warned what would become of Catholic institutions, but what you must now do, all of you, whether Catholic, or another assembly of Christianity is to unite in a refusal to bow before the State, and in order to do so, you must tell the State that you will not comply with any rule that abridges your faith, but more, that you will not pay fines levied and imposed, and that you will openly disregard them. You must prepare your flocks to see this enacted. More, you must do so in such a way that it permits them to choose and decide whenever they have that opportunity. I would strongly suggest that on some day in the future, unannounced until the very last moment, that the institutions of faith close its doors, all of them, at once and without public remark upon re-opening: “This is what things will be once the State commands all matters of conscience.” This is stern medicine. It means that there will be some who will die, who had depended upon these institutions. It means that some will go unpaid in their employment on that day. It means that on one given day, and for the space of time of one day, the Church will show what is being demanded by the State. Of course, there are people wiser and smarter than I among the clergy of the Church. I realize what I propose now is a grave action. I realize that it will require great planning, and due care and diligence to stave off the worst consequences. Despite this, I also know the Church is able. Christianity at large is able. These are competent institutions that have been ministering to mankind for generations and longer. The Church also knows about strikes. In Poland, under the banner of Solidarity, the Church quietly participated in aiding the strikers. The strike I propose is of a different character, however, and it consists not of making demands of the State, but instead, merely of temporarily complying with them. Barack Obama and his administration want to quietly remove all Christendom from the public square, as they do not hold the view that one’s faith should guide one’s actions when one emerges across the threshold of the Church into the public sphere. Just as in the old Soviet Union, where one’s freedom of religion ended at the church doors, so the Obama administration wants to cause the reach of the Church to contract. It is into this vacuum that the institutional left will pour its own influence. They hope to accomplish this slowly, with your surrender softening the blow at each step along the path. They are counting on the Church and all Christendom to help disguise what is happening. You must unmask this procedure, and you must not let them soften the blow. If you do permit it, you will lose the whole of your flock in due course. You will be barred from all public discourse. You will be made slowly irrelevant in the lives of Americans until they will no longer miss you. Churches will become empty, lifeless edifices of a faith no longer practiced and a belief no longer important. This has been the goal of every statist revolution in the last two-hundred years or more, and you have witnessed it. This is not the time for timid clergy, or appeasement. This is not the time for shrinking from the articles of your faith. This is the time to remind your flocks of the importance of the Church in their lives, not merely at worship, but in all their endeavors. It is also time to let the State know that this will not end quietly, or with your surrender. Presidents and their administrations come and go, as do the laws of men, and it’s time you placed this in its proper perspective for all concerned while you maintain the ability to do so. Religious liberty and the rights of conscience do not arise from the State. The founders of this nation knew this even if our present leaders do not, and they enshrined the matter in our Declaration of Independence. Let none pretend we hadn’t known the source of our rights, or that the Church answers to men.